Printed coasters are like business cards you can put your drink on! 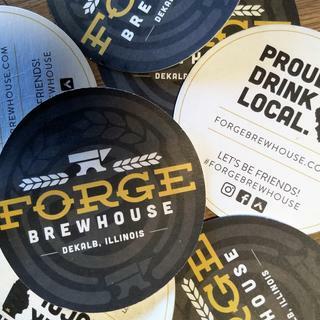 Full-color coasters are fantastic for advertising drink specials, new liquors, wines or beers, upcoming events and more. These economic pulpboard coasters are available in round or square shapes and can be customized with your message on both sides at no additional charge! Bleed imprint area: 4.125 x 4.125", Trimmed to 4 x 4". Keep live artwork within 3.75 x 3.75"
Disclaimer on printing two-sided designs: Two-sided designs may not line up head to head, and this not considered a defect. If artwork requirements need two sides to orient in a specific manner, please contact your dedicated account manager. price and convenience of ordering online. competitive pricing, easy checkout and design ! Look forward to testing your product, and placing large orders in future for many products after reviewing this product ! Great promotion item for in house and other bars to advertise our brand. Saw your coasters at a customer's business. I want to print on both sides. Economical pricing for quality product. The price was right for the quantity I was looking for, plus no setup charge. We like the full-color process, the fact that we can have art on both sides and no set up charge. Found online, samples sent had good print quality. we will use them under furniture legs that we stack. Great reviews and easy order process. Transparent pricing. It seems to be a really good deal. I will wait to see my proof! :-) Looking forward to it and placing additional orders. Web site was easy to navigate and the price is right. We'll see what shipping costs will be! I paid a LOT more locally to have some coasters made. I bet they ordered from you guys and are quadrupling the price! I need a great product for the best cheapest price range. Plus you can print on both sides and for 1,000 more coasters, it was only $10 more. inexpensive. I will order more if it satisfactory. can we print a different image for each side? BEST ANSWER: Thanks for your question! Different artwork can certainly be printed on each side. 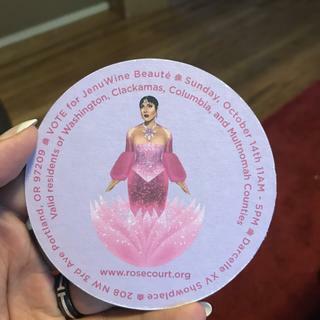 Hi there...I am looking into ordering approx 2500 printed coasters for a music festival and charity event that my non profit hosts annually and wanted to know if you offer any discounts to non profits? If you dont, I understand and appreciate your consideration. Thought I would ask. I can provide 501C3 verification....my non profit is called The Taylor Strong Project and we raise money for Law Enforcement, FireFighter, First Responder and Veteran charities...the non profit was started in honor of my daughter Taylor who was killed in a tragic car accident. Again, no pressure, just thought I would reach out and see if anything is available...thanks. BEST ANSWER: Please contact out Customer Service team at 1-800-989-2181 and they can give you a custom quote to better fit your needs. We love it! 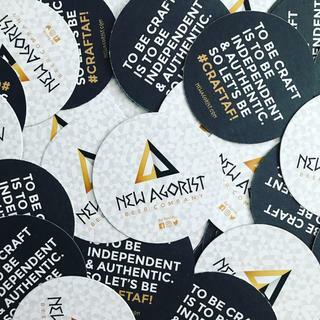 Using coasters as business cards is a great idea! Thanks for sharing! The stock and quality where all good. Our only issue was the colors. They were much darker than the art work sent. Thank you for your response. These coasters are made of a natural and absorbent material and are offset printed in CMYK. By nature of the material and printing method some variance to color may occur and vary from run to run. If a PMS match is required please speak to your account manager. Ordered these coasters for a campaign election. The final product was amazing and the price definitely was a deal. I would suggest ordering at least a month before you actually need them. I was expecting the delivery by a certain date and received it about a week after I asked for. All in all though, I was very impressed with the product and received tons of praise for a new approach to market oneself. Thanks Print Globe! I was very impressed in the quality of the coasters for the great price I received on them. I will be re-ordering again when needed! ACTUALLY, BELIEVING THAT GOING TO A LESS EXPENSIVE STOCK WOULD DIMINISH THE OVERALL QUALITY, IT HASN’T.THE ECONO LIGHT WEIGHT IS FINE……..LOOKS THE SAME, HOLDS ITS SHAPE.…….QUESTIONING SOME PATRONS WHO ASKED FOR EXTRA COASTERS, THEIR MAIN REASON WAS TO PASS THEM AROUND TO FRIENDS. THAT’S GOOD ADVERTISING. Awesome. Basic. Exactly what we needed. 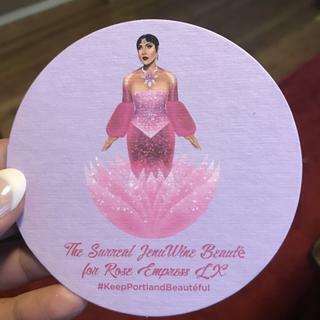 What you see is what you get -- basic drink coasters you find at any bar. Hard to argue with that. Nothing surprising (not thin paper, etc.). It's exactly what you'd expect. Perhaps the best selling point is how helpful the folks are PrintGlobe are. They were excellent to work with. Hi Dyer, thank you for your positive review! We appreciate so much that you took the time. Ordering from an online source can often be stressful, but we're happy to hear our team was an asset for you. We look forward to working with you again on your next project! The coasters were thicker than I had anticipated, the print quality was very good and, overall, I had a great experience. We will definitely use them again to print more designs!